Ask a hundred Spaniards “what is tapas?” and you’ll get a hundred different answers. For something so central to the Spanish way of eating, it can be a bewildering topic for visitors. Each city has its own tradition, from Basque pintxos stacked up along the bar to the big plates of free food with every drink in Granada. And since Madrid is a melting pot of people from across the country – and the world – we have a tendency to pick and choose from each of those definitions whenever we feel like it. So we want to help you find your feet, and give you the lowdown on the most typical Spanish tapas in Madrid. Tapas and drinks: quintessential Madrid! What is traditional Madrid tapas? Put simply, the classic Madrid tapas is a simple snack given for free with each drink. That’s why we tend to order small cañas of beer instead of larger measures. The more beers or glasses of wine you order, the more tapas you receive! The free tapa can range from peanuts or potato chips through to a slice of delicious tortilla or even a generous Granada-style plate of food! For a more refined version of a Madrid tapas staple, Casa Alberto is one of the last Madrid bars who still fry their own potato chips in-house. 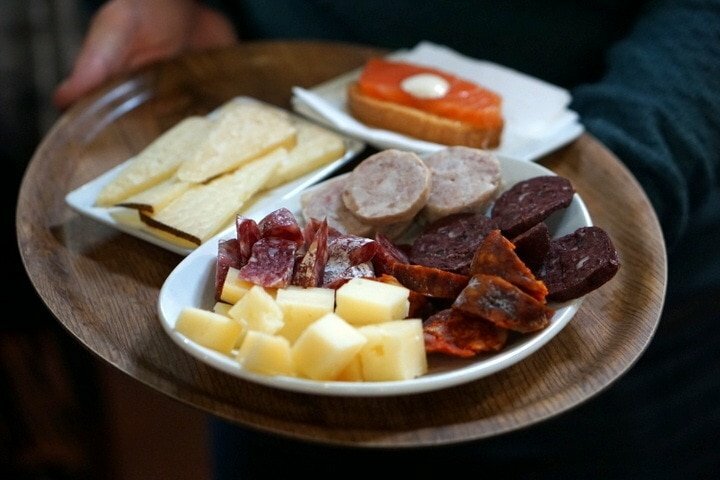 Tour with us: Discover how to do tapas like a local on our Madrid Tapas, Taverns and History tour. 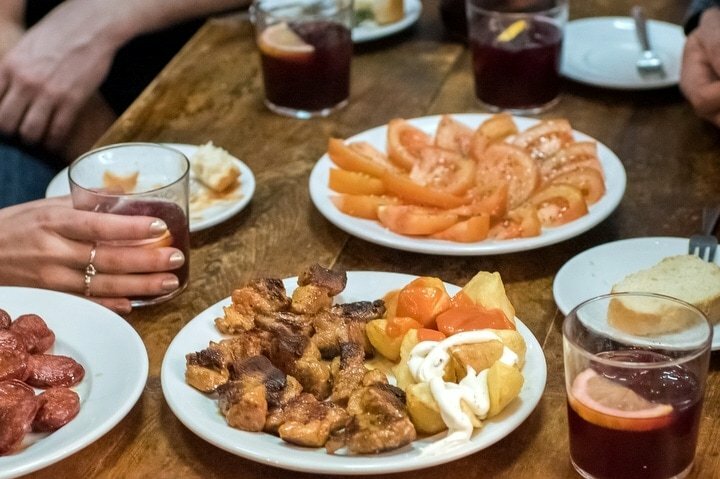 You’ll learn how to tell your tapas from your raciones in four fantastic local bars: the perfect way to get your tapas legs before diving into Madrid! 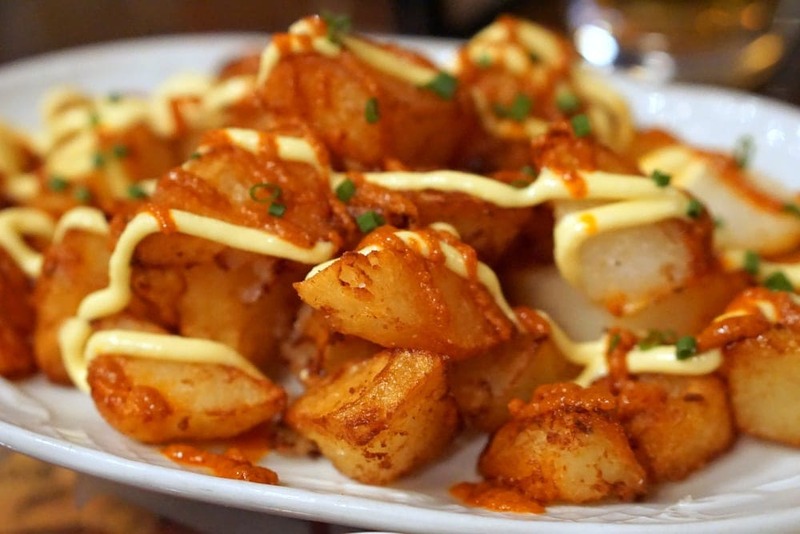 Patatas Bravas are one of the most famous Spanish tapas, but sadly they don’t always live up to expectations. The authentic bravas sauce (“brave”, so named for its spiciness) should be homemade and focused on spices, red pepper, and chili. Spanish food isn’t famous for its heat, but good bravas should pack a decent kick. Sadly, some bars will use a commercial sauce, or just add spices to a tomato ketchup. The best places, on the other hand, make their sauces in-house, often using secret family recipes passed down through generations. For the real deal, head to a bravas specialist like Taberna Acuerdo in trendy Conde Duque. Anchovies… but not as you know them! Read More: Find out what happened when Lauren visited the second-largest fish market in the world, here in Madrid! These days Madrid has no shortage of sensational fresh fish, with the second largest fish market in the world. But before motorways rushed the daily catch from the coast to the capital every morning, Madrileños had to depend on various preservation techniques to get their fix of fish. In Spain, preservation has become an art in itself, meaning you can find entire bars devoted to exceptional tinned fish or bacalao salado (salt-cured cod). But the king of them all is the boquerón: anchovies! These days, with fresh fish readily available, the best bars marinate their own anchovies in vinegar every day. The result is fresh, light, and addictive, closer to a ceviche than the brown morsels you might find on a pizza back home. Try them: For a different take on this tapas classic, Taberna Angosta in La Latina marinate their anchovies in honey and mustard. Tour with us: We try the best classic boquerones en vinagre in the city on our Madrid Tapas & Wine Tour! It’s quite common to get some Spanish jamón on a bit of bread as your free tapas here in Madrid. But for the best ham – the delicious, and expensive, acorn-fed jamón ibérico de bellota – you’ll need to look at the menu. Whilst we tend to order raciones – larger sharing plates – bear in mind that this might be too much (or too expensive) for just one or two people. Look out for smaller options, which might be labelled tapas, tostas (open sandwiches), montados (smaller tostas) or canapés. If in doubt, ask the barman: portion sizes vary hugely from place to place, so it’s good to get an idea of how much you’re ordering! Tour with us: Get a crash course in Spain’s most famous meat product in our new Madrid Ham Tasting Experience With Wine! Pintxos stacked along the bar: just point to what you want! 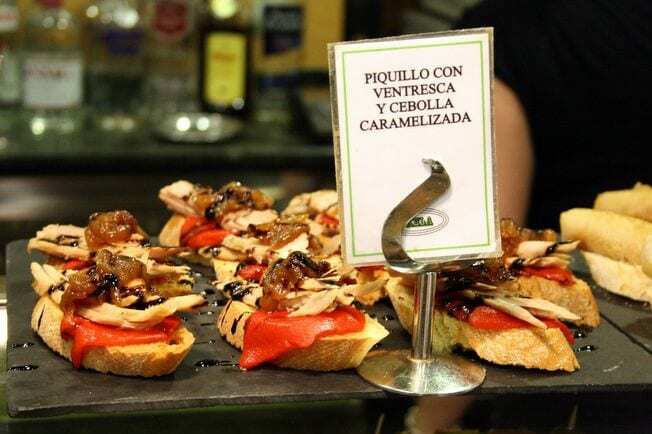 OK, strictly speaking, pintxos (or pinchos) isn’t a classic Madrid way of eating. But this tradition has taken root all over the capital, and we couldn’t talk about tapas without mentioning their Basque cousins. Delicious bites stacked on bread and skewered with a toothpick and lined up along the bar, the focus is often on creativity, innovation, and visual presentation. It’s also one of the easiest ways to get started on tapas: just point to what you want! 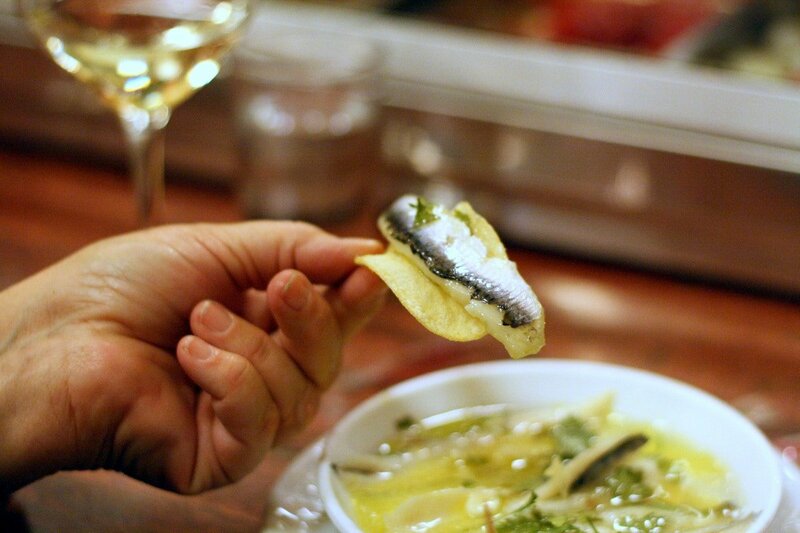 Try them: Txirimiri and Txakolina are two favorites in La Latina. For a more traditional vibe, Sagaretxe in elegant Chamberí has classic Basque cider alongside their pintxos. Looking for more tips for Spanish tapas in Madrid? Check out Lauren’s Madrid food guide, and get ready for a delicious trip! Professional tour guide from Scotland with a Spanish soul. 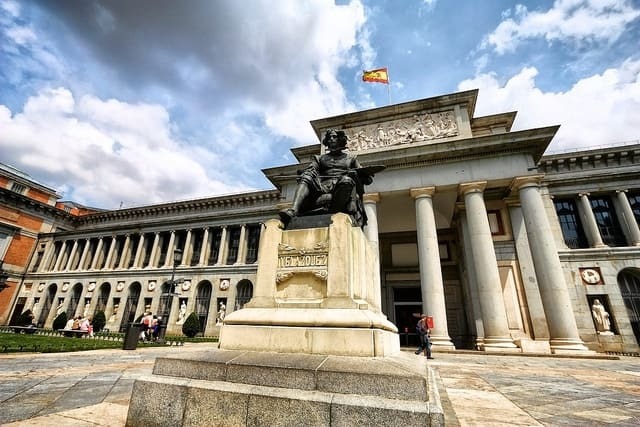 Obsessed with Madrid's museums, travelling around Spain, and with finding the best artisan potato chips in the city to wash down with a good sherry. Pingback: Where You'll Find the Best Free Tapas in Madrid - Top Picks!